Its 27th September about 5 o clock in the morning I am lying in my cell nervously thinking about the day ahead. Today I am in court and with court comes the brutal, degrading and humiliating tactic of the forced strip search of Republican prisoners. This is not my first time being brought to court so I know what lies ahead. My heart beats faster and faster I can actually hear it pumping through my chest as thoughts of what I am about to receive run through my mind. I might be worried but at the same time I know I wont comply to these bitter heartless torturers. The next few hours seem to drag in then about 7 o clock the alarm bells ring throughout the wing, they couldn’t be any louder. I lift myself up into a sitting position and stretching myself out I look into corner of the cell and see last nights dinner I had thrown it there as it wasn’t edible. Looking on the floor beside my bed I see my breakfast, a small packet of Alpen and a half carton of milk, the screws had threw it into my cell the night before knowing I was for court this morning. I eat this and when finished I keep the spoon as I will need it later. I rip up the plastic container it came with and the milk carton and I throw them out the window, this procedure happens with the three daily meals, it stops them from using the containers and cutlery over and over again and it also leaves the outside of the Republican wing looking like a rubbish dump which annoys the administration as they have to pay industrial cleaners every so often to come in and clean it up. I can hear the cleaners outside with big hoovering machines cleaning up the mess we had made by pouring the stuff threw the doors last night. I realise I had better go to the toilet quickly before they come and get me for court. The toilet consists of a sheet of newspaper on the ground and an empty half carton of milk, out the window the urine goes and onto the wall the rest of it goes. Its not a nice thing to be spreading this onto the wall first thing in the morning, not a nice thing to be doing anytime of the day but we have no other choice the administration has forced us into this position but at least today there is room to spread it, my cell was cleaned for the first time 2 weeks ago, before that the four walls were covered top to bottom with a double coat of excrement as well as the ceiling. The ceiling isn’t accessible to all the prisoners as height comes into play here. To cover the ceiling it entails stacking a load of newspapers on top of the plastic chair we have or placing your brown bag of clothes on top of the chair and standing on it, it takes good balance as it is awkward but it is a good feeling knowing that the person cleaning it with the power hose will be finding it difficult to dodge the waste coming down on him from the ceiling. Shortly after the door opens and there they stand. The riot squad. These are the hateful rats that work our landing every single day. There are four of them “shower, you’re for court” one of them snarls. I walk out carrying my towel, toothbrush/paste and soapbox, one of them takes these from me and searches through the towel and box, another searches me from head to toe while the other two just stand and stare at me with hate filled eyes. The four of them walk me the short distance to the showers, two to the front of me and two behind me, this is what they call controlled movement. No other prisoner will be out on the landing while another prisoner is on it and at all times he will have four of this riot team around him. At the showers they throw a box at my feet with a brown paper bag on top, in this box we have our clean clothes, they don’t let us wear the clothes we have in our cells when we leave the landing as they say they are contaminated. I take my clothes out of the box and lift the brown bag, they open the steel barred grille let me in and then lock it behind me. I’m only in a few minutes when one of them shouts “hurry up the bus is here” I take my time I’m in no rush for what lies ahead. I put the clothes I had wore leaving my cell plus the towel and toiletries into the brown paper bag I walk over to the grilles the same four are standing waiting. One takes the brown bag and searches it thoroughly while another searches me again from head to toe and the other two yet again just stare with their hate filled glare. “Right use the phone” one of them says I tell him that I can’t use the phone as my phone card is in my cell “not our problem” he says and I quickly realise that I wont get my 5 min phone call to my family today with that he turns to other members of the riot team who have now gathered at the reception desk “that’s him for the bus, he doesn’t want the phone” they all burst out laughing. Pathetic. Four of them again walk me the short distance to the grilles that leads me off our landing and out into to the circle, through one gate and then another a short walk to the turn-style,through it and straight onto the bus at the entrance of Roe house. The engine starts and away we go. There is a small hole in the material used to blank out the window and as we go through the two large electronically controlled gates I can see we pass the search box. The search box contains the boss chair which is a body scanner that can detect objects hidden inside ones body they put us through this on our way back from visits so why cant they just put me through it now instead of driving straight by it and on to the reception area where a body search will be forced upon me by a five strong riot team. My stomach is in knots as the van pulls up to the reception area. I’m brought into the reception area and asked immediately if I am going to comply with the strip search. My answer is no. They put me into a small room and tell me I have 15 minutes reflection time to think about it. “I don’t need it” I say but the door slams firmly shut. During this time I am pacing up and down the small room taking deep breaths and moving my arms and wrists in circular motions to loosen them up for the attack that lies ahead. After the allotted time the door opens and a governor walks in he asks me am I going to comply with the strip search, more determined than ever I repeat “no”, he asks is there anything he can do that will change my mind again I say no, “ok then” he says “I am going to order the search” and he walks out. Within seconds a five strong riot team rush through the door, one of them runs to the corner with a hand held video camera in his hand while two quickly rush me and grab my arms, they pull them straight out from my sides and twist my wrists, fingers and arms into some kind of martial art lock. A third grabs hold of my head and pushes it down to my chest whilst pushing me hard enough to force me to my knees. Whilst on my knees my arms are outstretched in a crucifix type position and my wrists are twisted agonizingly upwards. The fourth member goes behind me and pulls my legs from the kneeling position while the third one forces my head to the floor, all the while the other two still have my arms, wrists and fingers in locks, I am now lying face flat on the floor two of the riot squad are on the ground with me still with my arms wrists and fingers in these painful locks. Again the fourth member of the team begins taking off my shoes and socks, he searches them and finds nothing, he then pulls off my jeans and underwear leaving me naked from the waist down, again he searches these and finds nothing, Then the third one lifts my head about 8 inches off the floor while the other two have my arms wrists and fingers still in locks then the one doing the stripping pulls off my t-shirt searches it and finding nothing, he throws it on top of me and the senior officer of the riot squad tells them one by one to pull out. The first to go is the one stripping me he is then followed by the one who is holding my head to the floor. This leaves three of them still in the room, one in the corner who has been videoing the whole ordeal and the other two who have my arms, wrists and fingers in locks. All of a sudden one of them starts shouting “stop resisting, stop resisting” I can’t move never mind resist and at this they systematically pull my arms up outstretched behind my back. I squeal in agony, I don’t know how to explain the position I am in because I don’t think it would be humanely possible to put ones body in this shape, I think my shoulders are going to pop out, I feel my wrists are at breaking point, I am still screaming in pain when they let me drop to the floor, “don’t get up till we leave the room” one of them says. I just lie there in agony but a sigh of relief comes over me, it was over, for now. I walk out to the reception area and there is the riot squad standing laughing, they all stand tall as if they had just carried out something to be proud of. I just look at them smirk and turn and walk to the front door. Out we go and into the prison van for the short journey to Laganside courts in Belfast. Once there I am brought straight down to the cells and I wait to be called. Within the hour I am brought upstairs to the courtroom. I get to sit beside three of my friends who are in the dock with me, all four of us in court on trumped up charges placed against us by the RUC. Within minutes the judge adjourns it as the so called police witnesses haven’t appeared. I shake hands with my friends and am lead back down to the cells. I am held here for a few hours. They bring me lunch, a sandwich and a packet of crisps and then its back onto the prison van and the same short journey back to Maghaberry. The nerves in my stomach return again. I know they are waiting on me. Back in reception the whole brutal procedure is repeated again. I am in agonizing pain as I am brought back to Roe 4. I am lead straight to my cell by four of the riot squad. Two in front and two behind. The cell door slams behind me. My dinner is already sitting on the bed, freezing cold potatoes and some kind of cheese and broccoli slice. I throw it behind the door and lie down on top of the bed and think about the day I’ve just had. I ask myself, why do they drive past the search box with the boss chair in it? If they put us through the boss chair leaving Maghaberry then there would be no need for these brutal forced strip-searches. Then reality kicks in, it is all about power and control. I cant help but wonder what sort of person would you have to be to go to work every day and brutalise another human being ? A sick individual is my only conclusion. As I lie there in thought my cell door opens “anything for the duty governor” one of them says, I don’t even lift my head to acknowledge him the cell door slams shut. Its about half 6 now time to start the nightly building of the dam to block the door for when I put the stuff out later. Some skill is needed in mastering this art but within a few days I had it sussed. When I need to go to the toilet later I will use the plastic spoon I saved from this morning from breakfast to mix it all together until it turns into a brown nasty liquid which I will be able to pour out onto the landing.We never get to see it but I would love to see the state of the landing and the mess they have to clean up after all the lads have emptied their mix out the doors. With this done and after a little bit of reading I close my eyes and settle down for the night. Tomorrow brings a new day and although we might be locked up 23 hours a day I will get to see my friends and comrades during that little bit of exercise time. This brings a smile to my face because despite the treacherous conditions we are forced to live in despite the brutal regime we are forced to endure, the craic and the spirit couldn’t be greater. It fills me with great pride to play a small part in this phase of the prison struggle. We are more determined now than ever to see this protest through to the end and we will win. These men on dirty protest here in Maghaberry are brave men, these men are strong men but above all else these men are Irish Republicans. 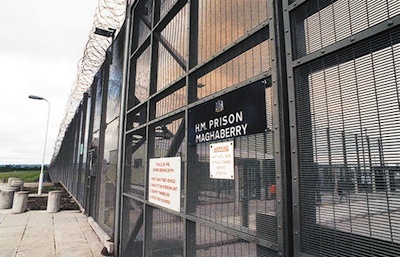 Victory to the protesting prisoners in Maghaberry.